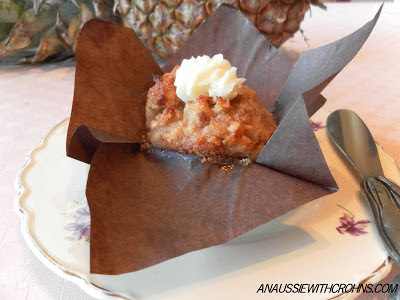 My husband came home from work last week, raving about a Hummingbird muffin he'd eaten. · Add the eggs and beat together. · Beat in baking soda, cinnamon and nutmeg. · Add flours and combine well. · Fold through chopped walnuts and drained pineapple. 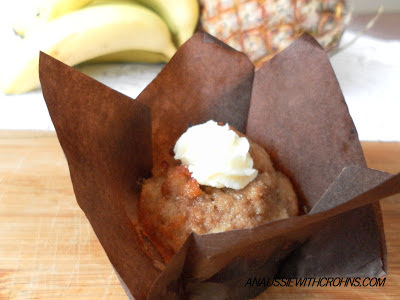 · Divide into muffin papers, filling 2/3 full. · Bake in 175 degree Celsius (350F) oven for 20 mins then reduce temperature to 150 degrees and cook for a further 5 – 10 mins. It’s OK to take them out of the oven if they still feel a bit soft or wet on top. They’ll firm up on cooling. · Combine all ingredients with a hand mixer. · Spread over cooled muffins. If you want to pipe the icing on the top like in the photo, you'll need to increase the icing recipe. Wonderful recipe! I tried it out on Sunday for my husband who has colitis and is following the SCD diet. He ate 4 in one sitting because they were THAT delicious.